This box is one of a kind! Only 1 available and it will not be available again! 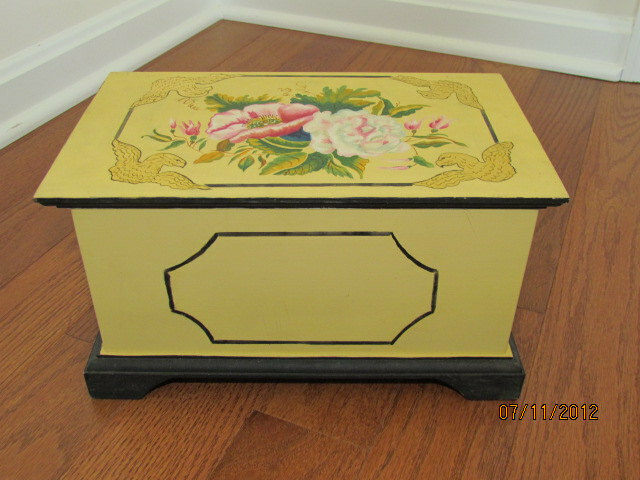 Hand painted box in butter color and accented with black trim along bottom and along rim of lid. Front and sides are decorated with an empty cartouche design. Inside is painted taupe to contrast outside of box. Top of box is beautifully painted in oils. Four golden eagles frame out a stenciled two flower motif. Flower colors include but are not limited to shades of pink, green and golden yellow. Back is painted but not decorated. Box is distressed to appear aged, sold as is. Approximate dimensions of the box: 11.5 x 7 x 6.5"